These signature muslin lined keepsake hampers offer a selection of gourmet foods ideal for sharing at the office or at home. Includes; carmel corn crunch, rich chocolate truffles, J&M cheddar cheese straws, chocolate covered pretzels, peanut brittle squares, Brown & Haley Almond Roca, Brent & Sam's soft and chewy chocolate chip and oatmeal cookies, cinnamon apple crisps, honey sesame sticks, Bellagio chocolate truffle hot cocoa, savory snack mix, dried fruit and nut mix, East Shore dipping pretzels, Robert Rothschild Farms raspberry honey mustard, Mediterranean multi-grain chips, chocolate filled peppermint candy drops, Dolcetto chocolate filled wafers, smoked almonds and sun dried apricots. 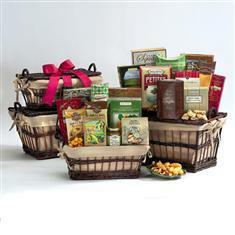 The Deluxe Grand Tower makes a great gift to show your appreciation!